Three of my colleagues and fellow owners – Deirdre Bohan, Rob Meyers, and Siobhan Mullin – joined me last month at a conference in Boston called Local Sustainable Economies. It was a national gathering, hosted by the Sustainable Business Network of Massachusetts, of people and organizations working to localize economic activity and encourage the long haul shift from the extractive economy of the present to a generative economy of the future. It was an inspiring place to be. Nobody was talking trump or trash. There was palpable excitement about extraordinary initiatives to transform economic activity to help people and planet at once. And although nothing is all peaches and cream in this “post-truth era” (as Ira Glass calls it) the stories we are telling each other and the work we are doing (and some data too! I’ll get to that) convinces me that optimism is warranted. Not long ago the transition from fossil fuels (which need to be left in the ground) to renewable energy (which is the most essential advance that technological progress offers) seemed un-attainable. It now appears to be inevitable. From un-attainable to inevitable. No matter how torn and tattered our nation may be, that’s good news. Two simple facts – the amount of available solar energy and the falling price of it – are responsible for this good news. 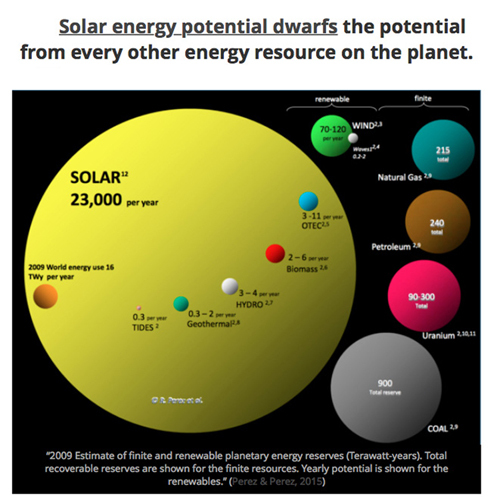 Not only does solar potential dwarf every other energy resource on the planet, but solar is truly on fire (so to speak). Our Director of Engineering, Marc Rosenbaum, gave me some information from a 110 page report by Alliance Bernstein (an asset management firm which handles a fund of half a trillion dollars) written to tell their clients what they envision happening in the energy sector. Based on the exponential growth in solar installation and what they expect in storage technology and electric cars they predict that a huge portion of fossil fuel reserves will become stranded assets and that there will be a major shift in what have been reliable investments. 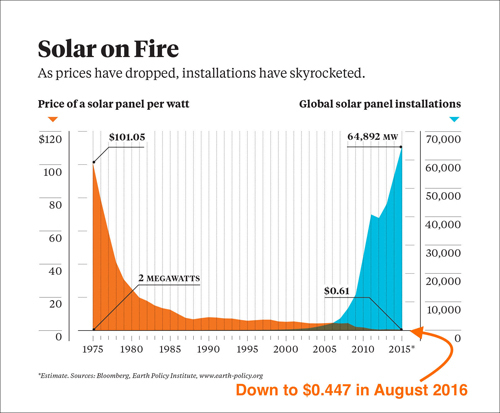 Solar deployment worldwide is exponential. The International Energy Agency and the World Economic Forum predicted, in 2007, that by 2015 there would be less than 25 Gigawatts of solar worldwide. There were 10 times that. The virtuous solar cycles, Alliance Bernstein says, will contribute to fossil fuel demand destruction. Harder and harder acquisition drives the cost of fuel up. Innovation in solar drives the cost of technology down. Alliance Bernstein goes on to say that the transition is irreversible and that any debate on climate change that continues to link economic growth, energy intensity, and carbon emissions is outdated. In short, climate change will not happen, not because climate science is wrong – it’s not – but because the amount of CO2 the world produces is about to plunge. They go so far as to predict global carbon emissions will peak in 2019 because the fossil fuel industry is crashing to the ground like a busted stepladder. The fossil fuel will stay in the ground, just like Bill McKibben, Al Gore, James Hansen and so many others have said for so long that it must. All of this is counter intuitive in a way. Solar advocates like me always thought it was important that solar costs be compared to the true cost of oil, with all externalities included, and that only high oil prices would speed the adoption of solar. Turns out not to be true. LOW oil prices, like now, make it increasingly less profitable – or not profitable – to extract oil from the ground. So, ultimately, a lot of it will stay there. Consumer choice is not the driving force; it’s the energy corporations’ inability to make a profit, the same thing that eventually killed nuclear power. The rising use of electric passenger vehicles is another promising recent development, both because they represent new uses for renewable power and because flexible battery storage can help reduce a major problem inherent in unpredictable wind and solar energy sources: that the power they generate is variable and intermittent. Plugging parked electric vehicles into buildings or power grids allows their batteries to discharge to those grids during hours of peak electricity demand and draw from them during off-peak times. Even a hundred vehicles in a parking lot, just sitting there, could supply sufficient energy for a 150,000 square foot office building during peak hours. A chief obstacle to broader consumer adoption of such vehicles is high battery cost, but that too is falling fast. And breakthroughs keep coming. Kevin Kelly, the founder of Wired Magazine and most recently the author of Inevitable, an eyes-wide-open book about the future of technology, says, “Those who try to predict the future are actually trying to predict the present. We look into the future to help us determine what we should do, right now. “ On April 30 of this year, Germany established a new national record for renewable energy use. For part of that day 85% of all the electricity consumed in Germany was being produced from renewables. That’s nothing to shake a stick at. It’s the future, in our face, right now. But no matter how inevitable the switch to renewables is, time is still our foe. This good news does nothing to diminish the urgency to do everything we can possibly do to help this transition happen as quickly and as equitably as possible. But good news it is. Just like all the good news at the Local Sustainable Economies conference. Smart, passionate, engaged people fearlessly and relentlessly inventing the future we need rather than accepting the future we’re handed. At South Mountain, solar is booming.